If you are looking for a secluded beach away from the crowd that offers breathtaking view of the emerald blue water and islands at a distance, then Tanjung Rhu is the beach to go. This is one our most favorite beaches when it comes to scenic settings. 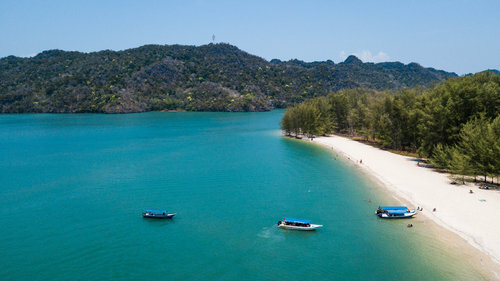 The beach is located at the north eastern edge of Langkawi at a remote corner. The word Tanjung in Malay means a cape or a promontory, and Rhu stands for casuarina trees. So as the name suggests, you will see lots of casuarinas fringing the cape area and the beach. 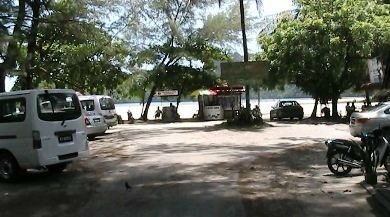 If you approach the beach along the road Jalan Tanjung Rhu (#111), near the village Padang Lalang you will find a coastal road that goes all the way and ends at the public beach. The coastal road goes by the side of Tanjung Rhu Resort which has a private section on the beach. In fact when you reach the end of the coastal road and into the bay area, on the left you can see the private beach of the resort which is separated from the public beach by a fence. The place where the coastal road meets the sand, there is a concrete structure with a board that spells out the name of the beach "Tanjong Rhu". Once you enter the public beach area, it's a wide and long stretch of white soft sands that stretches for miles to the right. The sand is really fine and can become very hot on a sunny day. We once had a tough time having to negotiate the blistering hot sand as we struggled to walk across to the water on bare feet. The beach is some 50 meters wide. If you plan to swim, you will need to change somewhere under the casuarina bushes that border the beach. But the challenge would be to walk barefoot on the sand if it is hot. Although the beach is fringed on one side with dense casuarina trees, you wont find much shades there. It's actually difficult if not impossible to get into the bushes. However luckily at Tanjung Rhu, there is always a cool mild breeze flowing from the Indian Ocean and you don't really feel the heat. The view of sunset from Tanjung Rhu beach is simply awesome. 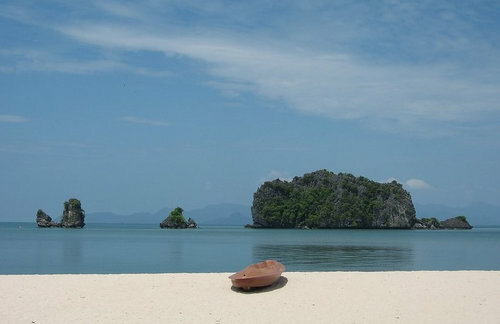 So if I have to choose the most romantic beach in Langkawi, Tanjung Rhu would be one of the top beaches. Unlike in Pantai Cenang beach, this beach here is free of crowd, quite secluded and nobody to disturb you. If you carry a beach mat, few beers and some food you are all set for the day. You can swim to your heart's content as long as you want. The water at the beach is shallow and great for swimming. It's a great beach for families with children. However sometimes the water close to the beach may not be too clean because of the mangrove swamps close by. Tanjung Rhu beach overlooks a few islands ahead. During the low tide when water recedes, you can even walk down to the nearest island Pulau Chabang. Snorkeling is excellent close to the island where you can see lots of colorful marine life. It's a family beach. But there are no public toilets of changing rooms here. However at the entry to the beach on the right of the coastal road, there is a rustic restaurant. You can use the bathrooms here in emergencies, they are not too clean though. The restaurant sells snacks and Malay meals. We love the fresh coconut water (RM5 per coconut). There are small huts outside where you can sit and enjoy the view of the sea and beach activities. On both sides of the coastal road, there are lots of stalls selling clothes and souvenir items. Things are a little expensive out here which is understandable given the remoteness of the place. Take a stroll along the road and soak in the rustic life of the area which is quite isolated from rest of the island. Tanjung Rhu Beach is a public beach (although there is a private section that belongs to the Tanjung Rhu Resort), accessible 24 hours and there is no entry fee. The shops and the stalls close by sunset. Update October 2014: There is now a gate at the entrance and a security guards posted there. But no worries, just fill out the environment protection form and they will let you access the beach without any problems. 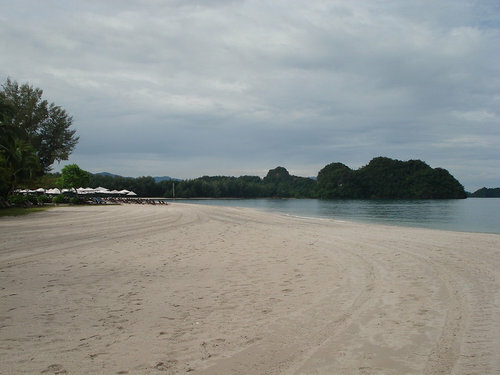 Tanjung Rhu Beach is located on the northern shoreline of Langkawi. You can access the beach from the road Jalan Tanjung Rhu and then taking a diversion to a coastal road that goes all the way and ends at the beach. It is about 22kms from Kuah Town. You can come to the beach by a taxi (fare RM40 from Kuah) or by a rented car. See the location in the below map. Few kilometers to the west is Black Sand Beach on Jalan Teluk Yu road. Further west at a short distance is the Shark Bay Beach. There is a dirt road behind the stalls at Tanjung Rhu that leads to a small river jetty. The Kilim river goes around the cape and meets the ocean. You can get boats from here that leave for the popular Kilim Geopark & Mangroves Tour. But come early (by 10am) because if the tide recedes, the boats can not leave. You can also rent a boat (a motorboat with a boatman) by the hour and visit some of the nearby islands, and also see amazing limestone formations on the shorelines. 1) Tanjung Rhu & Teluk Yu Attractions: All the nearby attractions in the same area. 2) Tanjung Rhu & Teluk Yu Guide: All about Tanjung Rhu & Teluk Yu areas including activities, hotels, restaurants, shopping, nightlife etc.